Friday's Netflix premiere of David Letterman's interview with former President Barack Obama received negative reviews from the press, with critics calling the host too "fawning" and the overall show "bland" and "lackluster." 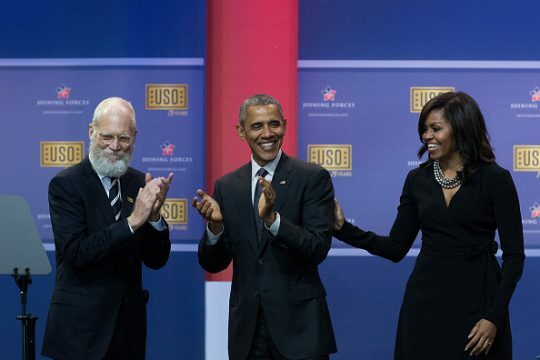 Letterman, who was a staple of late-night television for 33 years with "Late Night" and then "The Late Show," spoke to Obama for the first episode of a six-part series in which he speaks for an hour with people who he admires. The Obama interview, conducted at City College in New York City, touched on his post-presidency, Russian election interference, voting rights, race, family, and more. However, Letterman's obsequiousness, Obama's cautious answers—he never directly mentioned Donald Trump—and the fact that the interview was taped last fall made for a tepid viewing experience. "In basically ignoring the ever looming current President of the United States on another s**tstorm of a day, the pre-taped result from last fall was primarily a warm, fuzzy, and sauntering up on dull chat between two well-spoken men who obviously like and respect each other and didn't want to cause each other any possible grief," Deadline‘s Dominic Patten wrote. "This debut episode of ‘My Next Guest' was not scintillating television by any stretch." The Washington Post‘s Hank Stuever panned the interview as "flat," criticizing Letterman as too much "in thrall" of his guest. Letterman told Obama at one point that he is the only president who he has ever truly respected. "Both men seem rusty at the art of banter," Stuever wrote. "They're off their game. The interview doesn't produce any surprising or newsworthy statements from Obama." The Boston Globe expressed annoyance with the format and said it did "nothing interesting at all." "It's all pretty rote and familiar, and what's worse is Letterman's stage and interviewing manner, which is clearly rusty," Matthew Gilbert wrote. "He fawns over his guest more than he should, he makes awkward jokes about this new-fangled thing called Netflix, and he drives the conversation into a mutual children-appreciation session so that he can enthuse about his son and Obama can enthuse about his daughters." Spin‘s Drew Salisbury hit Letterman's interview style for failing to probe Obama deeper, saying, "Aside from a few moments, the interview is unfortunately neither revelatory or particularly engaging." USA Today‘s Kelly Lawler called the interview "a bit lackluster," saying it livened up more when the two men discussed their children. Vanity Fair writer Laura Bradley expressed disappointment with the "bland" show failing to go deeper with Obama, as well as dodging Trump discussion. "Although Letterman is too experienced and too wry by nature to engage in outright platitudes, his series' premiere feels like a lot of generalities and old news masquerading as something more profound," she wrote. Variety praised Letterman's wryly activist approach and said it "isn't bad", but Sonia Saraiya also wrote that the pre-taped format was "stale." "Letterman was never known for his interrogatory skills anyway—the occasional delightful curveball notwithstanding—and nothing he does here is going to reverse that impression," Vulture‘s Matt Zoller Seitz wrote. The Hollywood Reporter‘s Tim Goodman said the interview was "not groundbreaking" and added that it was a "big disappointment" not to get juicy Obama remarks about Trump. But he added that the point of the show was a welcome one: to allow a more serious Letterman to come through. The reviews were not all bad. The New Yorker‘s Ian Crouch lavished praise on Obama for his looseness and humor, saying he would make a good television host himself, although adding—less critically—that the ex-president's remarks during the hour-long show have mostly been said before. "The effect is familiar, and is enough to make a sympathetic viewer feel wistful for saner times, but perhaps little else," he wrote. This entry was posted in Politics and tagged Barack Obama, David Letterman, Netflix. Bookmark the permalink.